I didn’t love Vietnam…I wanted to love it but I just didn’t. 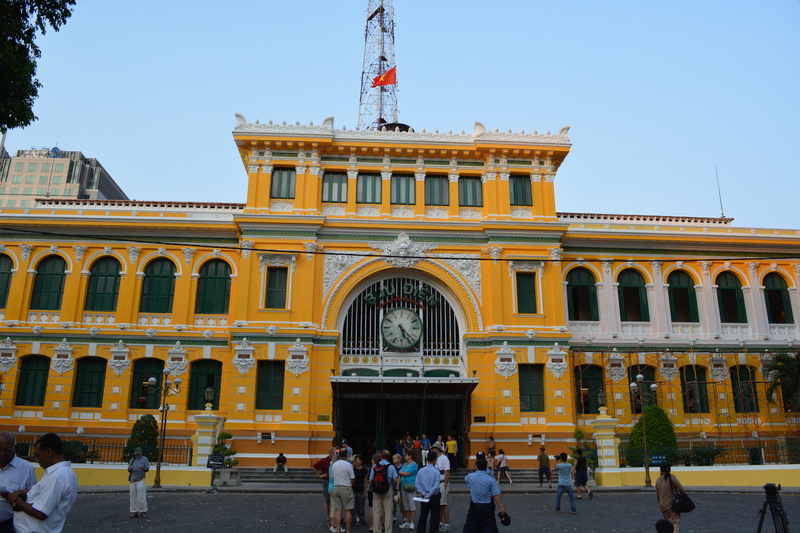 We landed in Saigon/Ho Chi Min City and were greeted by our guide and taken to our hotel. The hotel was in a busy neighborhood and was pretty warm with mediocre air conditioning and our room smelled like smoke. Everyone seems to smoke in the Asian countries we visited and smoking indoors is still very acceptable–ugh! The sights of Vietnam were very different from Hong Kong and we felt right away that we were in a whole different world and it was hot and sunny during our stay. 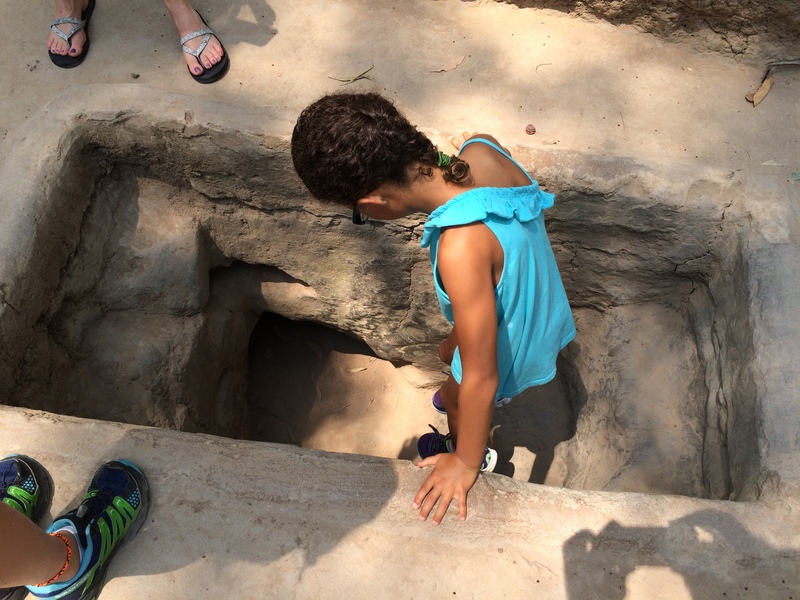 We visited many different history museums and the Ku Chi tunnels where the Viet Kong dug in during the Vietnam War. We actually crawled through them ourselves and it was hard to imagine that people lived in these tunnels for long periods of time in the dark, tiny, and incredibly cramped spaces. According to our guide—the tunnels had actually been enlarged to fit tourists—so they were actually smaller when in use. Jared and I just fit through the tunnels so can’t imagine how much more cramped they would have been. The Viet Cong were very resourceful and enlisted the help of entire families to fight in the Vietnam War or ‘The American Conflict’ as it was referred to in the history museums. 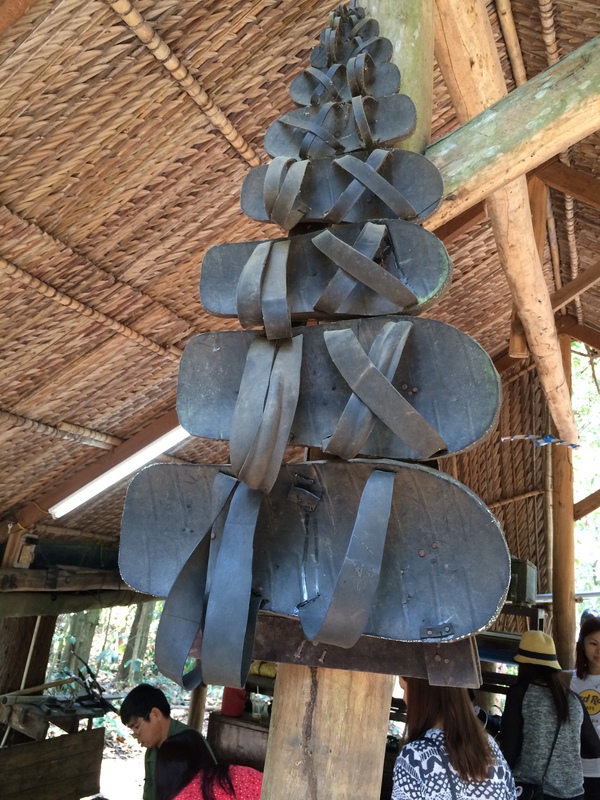 Women and children assisted with the war by creating sandals from tires, along with weapons and traps. The stated goal was to inflict injuries on the American GIs so that they would take out 3-4 people at a time instead of just killing one person. With one or two people maimed generally 2-3 others would try to help the injured person and would be easier targets or at least slowed down considerably. It was effective and disgusting. War is horrible and makes people do things they would likely never even dream of in regular circumstances. 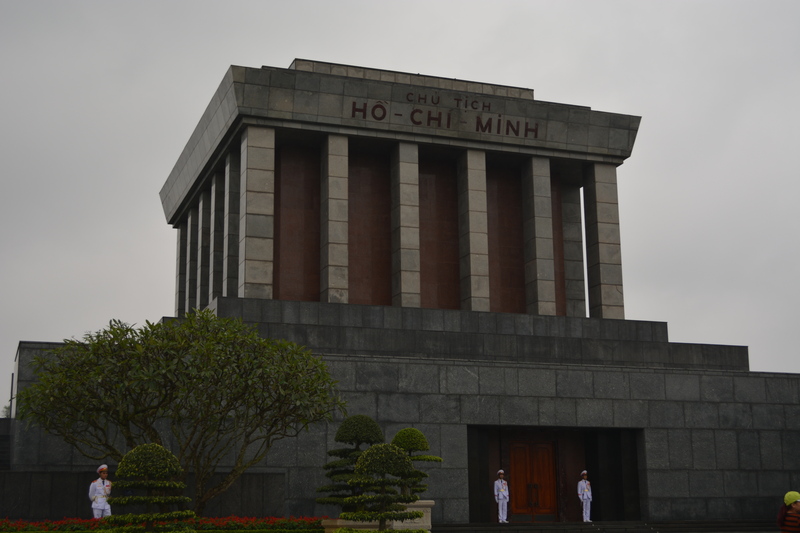 We went onto to visit the Presidential Palace and the War Remembrance Museum. The next day we took a quick flight up to Hanoi, which is a much larger and older city. Our hotel in Hanoi was right in the middle of the historic quarter and quite cozy—we had two rooms so Lilli and I took one and Jared and Bella took the other. The room that Lilli and I stayed in never seemed to cool down and had a lot of alley noise that filtered into our room. The people at the hotel were very nice and accommodating but it wasn’t the true escape at the end of the day that we needed—I was feeling very uncomfortable inside and outside of our room and never got a break from the chaos of Vietnam. Being there was an assault on the senses—loud, congested, smelly, dirty, colorful, and hot—everything was just a little too overwhelming and sensory overload. We also unfortunately “lost” our friend’s DVD player at this hotel along with tons of movies-we had it when we checked into the hotel but not when we checked out. One of our adventures in Hanoi was to find a restaurant that was recommended by the hotel. 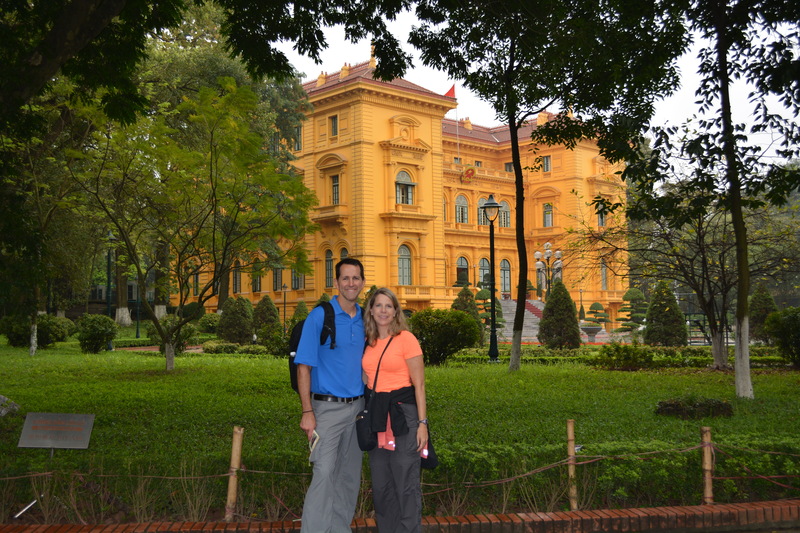 Walking through the old part of Hanoi is not like any other city we’d been too. The streets are winding/twisting and completely congested with cars, motorcycles, and mopeds. The mopeds fill the “normal” sized streets from the left to the right of the street. 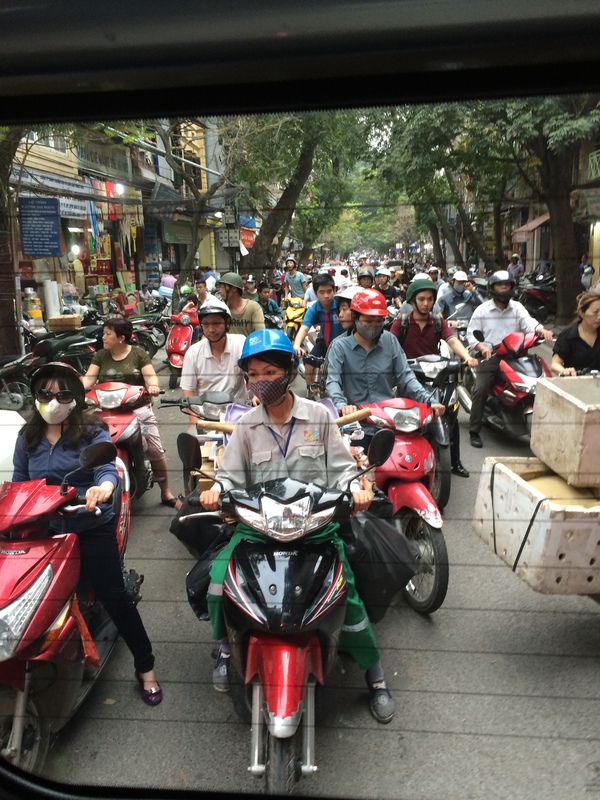 The motorcycle and moped riders are masked to keep the pollution and sun off of their faces–many also wea long sleeves and long pants and/or long skirts. This seems unremarkable until you realize the heat is around 90 degrees fahrenheit–and 95% humidity. the most be boiling hot underneath there. Most of the streets are one-way – but if not then they are major streets divided by a median or some type of barrier. You rarely see traffic lights so most of the streets are one constant swarm that look like schools of fish. If you need to cross the street you would wait forever for a break in traffic, and it will never come. So you find a crosswalk—look in the direction of the oncoming traffic and dive in. You must keep walking at a steady pace in between the passing cars and the motorcycles will steer around you. If you break your pace or run—which you really want to do—you must restrain yourself or likely be hit because they are predicting where you will be when they reach the crosswalk and driving to the spot in front of or behind you. In addition to crowded streets in crossing, the other challenge is congested sidewalks. Most businesses in Hanoi are small independent stores run out of the ground floor of a family apartment. Instead of big box stores there are entire streets dedicated to what you mind find in one aisle at Costco—one street is the fruit aisle, another is automotive parts, another is clothing, etc… Each residence has a garage door sized entry into their rented space and within this space is their residence and business. The business starts within the garage space but also spills out into the sidewalk. On the 6’x6’ area of sidewalk is their showroom, service counter, and checkout and lunch room. 45 minutes after wandering around we finally found our way to the restaurant (which was supposed to be a 10 minute walk) after winding our way through the busy streets—in the dark—and stopping to ask directions several times from people who only speak Vietnamese. Everyone was anxious to help and used gestures to get us moving in the right direction. We were very close and eventually found our way after walking into a hotel and getting some updated directions and a better map. After a delicious typical Vietnamese dinner, the walk home was the predicted 10 minutes. In Hanoi our guide was talking about what I thought was a hotel called “The Parisian” and that we should go there in our free time. I knew that Vietnam was occupied by the French back in their Indo China days so a hotel called The Parisian seemed plausible—but I couldn’t find it in any of our guidebooks. Our final afternoon in Hanoi the girls and I begged off touring and Jared went out on his own to see a few things including The Parisian. 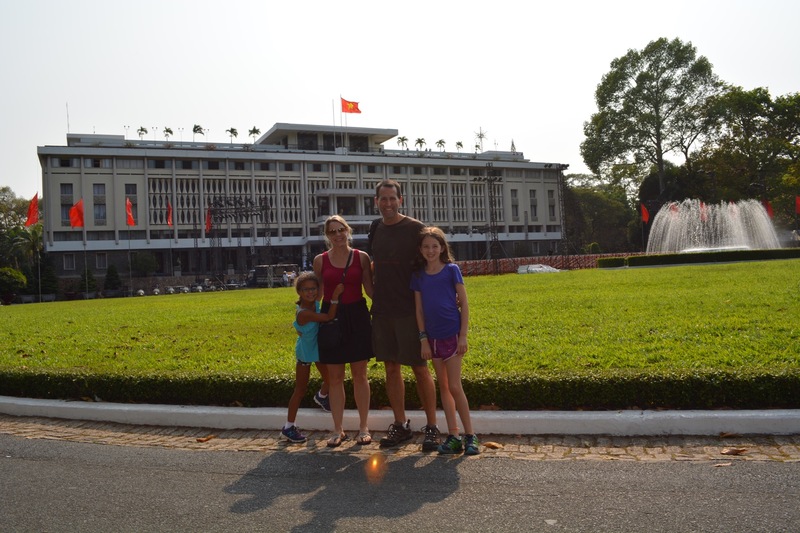 When he returned it was with a broad smile and an explanation as to why we couldn’t find this site in our guidebooks—because it was actually the Hanoi Hilton—The PRISON (which sounded like Parisian when our guide said it in English!). While on the tour, it was explained that the “guests” were all well treated even though they were prisoners. Jared decided to come back to Hotel L’Opera where we were staying instead of getting a room at the Hanoi Hilton/Parisian. After a couple of days in Hanoi visiting more history museums including a women’s museum, a cultural museum for children, the presidential palace and the living quarters of Uncle Ho (Ho Chi Min), we took a 3 hour drive to Halong Bay, situated in the northeast of the country. This UNESCO World Heritage Site is a series of islands in a protected bay and a recreational area for Vietnamese as well as foreign tourists. We took a two night cruise on a wooden boat called a “Junk” –which is a traditional fishing boat fashioned into a cruise ship. We had plenty of company the entire “cruise” as there were many other Junks out on the water with us and all seemed to be following the same itinerary. We were never out of sight of at least 5-6 big boats at all times and each boat held from 40-100 guests depending on the size. 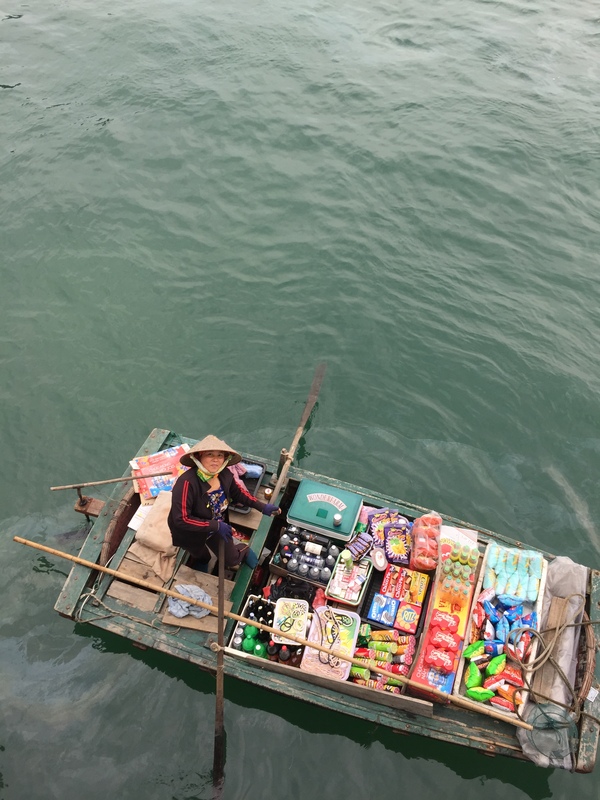 An interesting occurrence was when the “convenience store boats” (small row boats) would pull up alongside your boat to convince you to buy some of their wares. These enterprising shopkeepers had everything from water, soda, wine, candy, chips, cookies, and souvenirs. 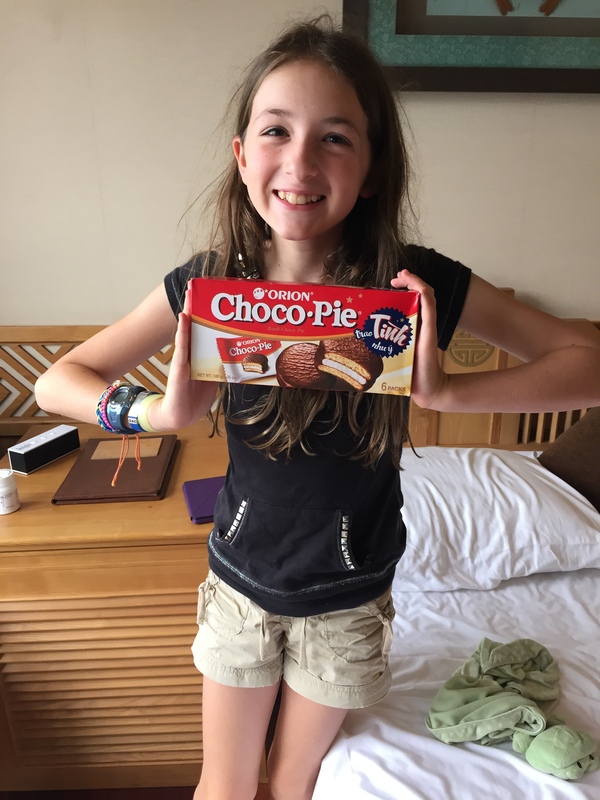 The girls thought it was awesome and convinced me to buy Oreos and Choco Pies. The storekeeper sent up the goods via a long pole with a net at the end, and I sent our payment down the same way. The islands are beautiful steep green mountains covered in foliage that rise up straight from the water. Because of the steepness, they are uninhabitable for most creatures other than birds. The bay feels like something out of a fantasy novel–it’s gorgeous and exotic. If it wasn’t so crowded and polluted— it would really be amazing. The cruise itineraries are set to go from island to island and our first excursion left us off at a beach where we climbed up to a gazebo for a view of the bay. The challenge with this climb is that it is up steep, winding, and crowded stairs. The passengers from all of the other boats in the bay are on the same itinerary, so the view climbing up is limited to the back of the person in front because we are packed together like sardines. Once you reach the top you are still elbow to elbow with your fellow hikers, who are all jostling to get a view of the bay as well as room to light their cigarettes as we all enjoyed nature together. Yes, I was miserable, and couldn’t get down the hill fast enough. As we waited on the polluted beach for our ride back to the boat, some people were actually swimming in the garbage-laden water… but I would only let the girls go in up to their knees. As we waited, we picked up garbage out of the water and off of the beach to leave it nicer that we found it. We filled plastic grocery bags with plastic bottles, ice cream wrappers, soda cans, cigarette packs, and other junk. 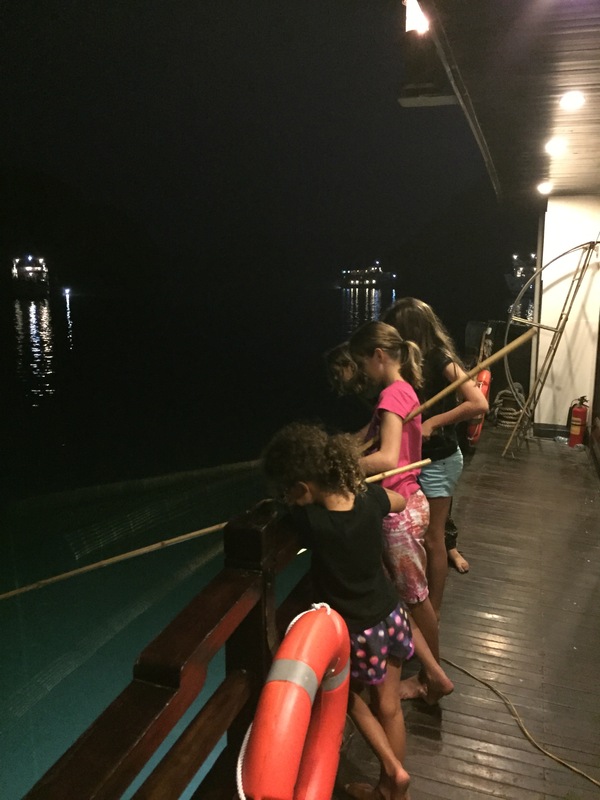 The girls worked hard to clean up so we rewarded them with ice cream treats before returning to our boat. 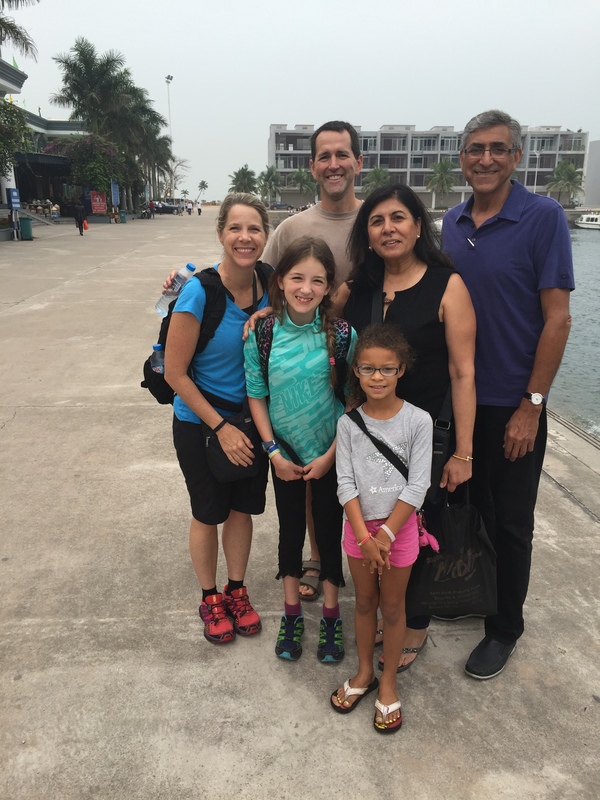 On the cruise, we met a lovely couple from Toronto, Canada on the boat and enjoyed spending time with Chuck and Roopa. We really enjoyed getting to know them and spending time talking and comparing notes on our travels. Communicating with the restaurant staff on the cruise was quite challenging because of the language barrier. We would ask for certain things and end up with something quite different like asking for a fork and being brought a side of vegetables instead. J There was another family on the boat as well one evening with a couple of daughters around Lilli and Bella’s ages so they all had a good time playing together and fishing off the back of the boat. Overall, I didn’t love being in Vietnam and upon reflection I think it is probably my fault—we should have done it differently. Visiting all of the history museums and seeing the atrocities of “The American War” and the re-unification propaganda; “thank goodness the Americans were sent packing back to the U.S. and we can all be one big happy communist Vietnam now” was quite disturbing. This was too much of our itinerary with the exception of the trip to Halong Bay, which was disappointing for completely different reasons—crowding and the polluted bay. There are other beautiful places to see in Vietnam and I have friends who have enjoyed beautiful bike rides, beach tours, and spent more time in places like Hue and the countryside—which would probably have been better for us. We DID love all of the people we met and really enjoyed the food. People were so very nice and accommodating and very industrious—everyone is busy working pretty much all of the time—the work ethic seemed very strong and everyone had a hustle in their step. 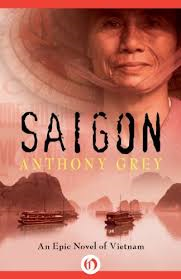 Since leaving Vietnam I have read the book Saigon by Anthony Grey. It was an interesting read and I learned a lot more about Vietnam and wish I had read it prior to visiting. 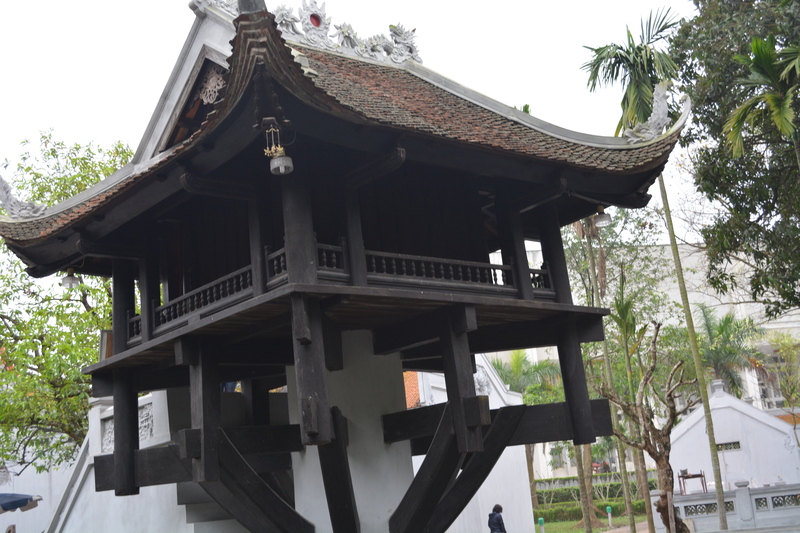 It will be my goal to revisit Vietnam and add on Cambodia—and likely stay away from the big cities and history museums. Also, seeing garbage everywhere is tough—and Vietnam was full of it. A wise friend said to me, “people can’t worry about picking up garbage when they are struggling to meet their basic needs—food, safety, shelter”, which is so true. In theory, Vietnam now has the freedom they craved and are governing their own country. The next logical step in my humble opinion would be to move to a governing model where all people have a say and eliminate corruption to further improve the lives of the people. If there is one constant from country to country—no one seems to like their government/politicians and corruption is present everywhere. The third world countries we have visited appear to be highly corrupt –many of those in charge line their own pockets and the pockets of their friends and the general population lives in poverty and struggles to meet their basic needs—food, shelter, water, education, healthcare, etc… As countries move up to 2nd world and 1st world the levels of corruption seem to lessen—it’s not that it is eliminated but it looks to be less prevalent and more people have a better chance of meeting their basic needs. Education is a key factor—in general the more highly educated the people, the better their lives are and the more successful the country is in terms of employment, GDP, and average household income and I will write more on this later. Next up, Thailand—one of our favorites for the whole family! Great post Kim! 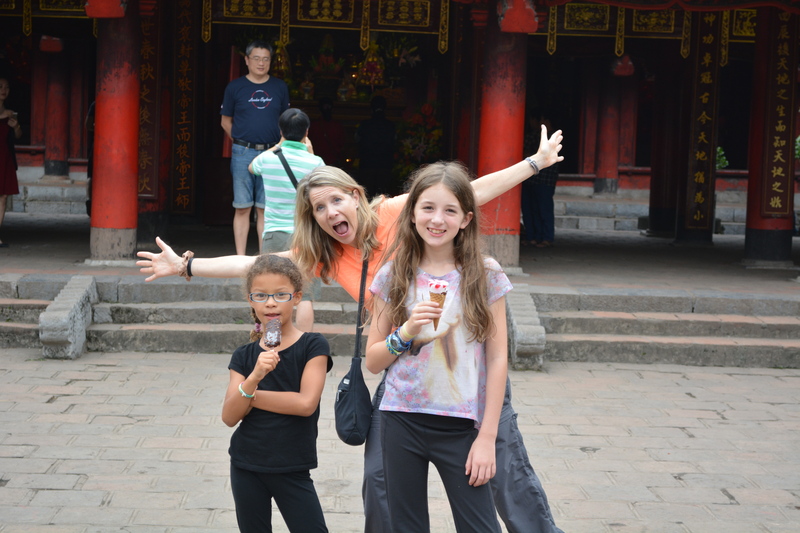 I love reading your blogs and we have fond memories of our time spent together in Halong Long bay . Lovely photo of all of us. Just read your Thailand blog, Chuck and I will like to tour Thailand in a year or two and I will email your for some pointers. Are you travelling in Eurpope or back home again? Love to Jared and the girls. Hi Roopa! We have another week in Europe and then home. Would love to share our thoughts on Thailand. Send our love to Chuck as well! !.